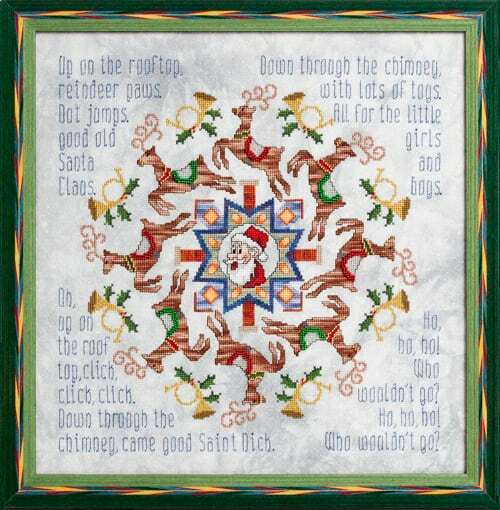 Up On The Rooftop is the modified version of the original Up On the Housetop written by Benjamin Hanby in 1864. Benjamin Russell Hanby was born in 1833 near Rushville, Ohio, and the son of a minister. During his short life, he wrote some 80 songs before dying of tuberculosis in 1867. Fabric: Stitched on 28ct “Crystal Helix” Linen hand-dyed by Picture This Plus. Design Area: 14-1/8″w X 14-1/8″h. Fibers: A total of 18 colors of Sullivans floss, 5 colors of DMC Color Variations, 3 colors of Kreinik #4 Very Fine Braid, and 4 colors of Mill Hill Beads were used in the model. “Best Match” comparable colors for DMC and Anchor are also provided.